The youthful Scottish team (6-4) posted two wins, including an absolute must-win over Kevin Koe of Canada (7-3) in the evening draw to keep alive its hopes of making the playoffs in the Pioneer Hi-Bred World Men’s Curling Championship, presented by Service Experts, Heating, Air Conditioning and Plumbing. Down 6-5 with hammer in 10, his team was confident. Trying to find a way out of the giving up more than one in the end, Koe’s last-rock draw was exposed just enough that Mouat could use it to kick out both Canadian stones and leave himself sitting three for the win. “We had a couple shots to maybe get out of and then if my shot is a rock higher I don’t think he has a shot for two. 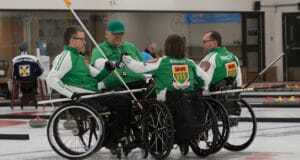 You have to be pretty precise out there sometimes and we were just a little off,” said Koe. Koe, third B.J. Neufeld, second Colton Flasch, lead Ben Hebert, alternate Ted Appelman, team coach John Dunn and national coach Jeff Stoughton, fell behind early, giving up a deuce in the second and a steal of one in the third. 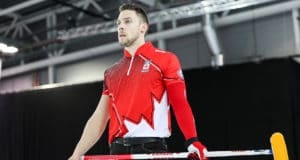 Just as the crowd was getting restless, Koe made an end-saving draw against three for one in the fourth and Canada stole two in the fifth when Mouat rubbed on a guard on his final-stone draw. Mouat, third Grant Hardie, second Bobby Lammie, lead Hammy McMillan Jr., alternate Ross Whyte and coach Alan Hannah were set for a possible multiple score in the sixth. But with his final stone, Koe came through a port and took out all three Scottish stones. Scotland then blanked two ends until it got the break it wanted in eight. Neufeld only got one rock on a double-takeout try and Koe rolled out on a hit-and-stick, leaving Mouat a hit-and-stick for two and the lead. Koe and Co. regained the lead with two in nine, burying shot rock early and ultimately have a straight hit-and-stick for the deuce. John Shuster of the United States (7-3) posted two three-enders and had Yuta Matsumura of Japan (8-3) his second straight loss, 10-4; SooHyuk Kim of South Korea (1-10) scored three in the second and fourth end to pick up their first win, 8-5 over Magnus Ramsfjell of Norway (2-8); and Joel Retornaz of Italy (7-3) had two deuces to pick up a vital win, 6-4 over Jaap van Dorp of the Netherlands (3-7). With one day left in round-robin play, only Sweden (9-1) and Japan (8-3) have qualified for the playoffs. Six teams advance. Others still in contention are Switzerland (8-2), Canada, Italy and the U.S. all at 7-3 and Scotland at 6-4. The 2019 Pioneer Hi-Bred World Men’s Curling Championship continues with draws Friday at 9 a.m., 2 p.m. and 7 p.m. (all times MT).